Sometimes you may change your mind and want to cancel a trade or shift pickup request before your manager has made a decision on it. 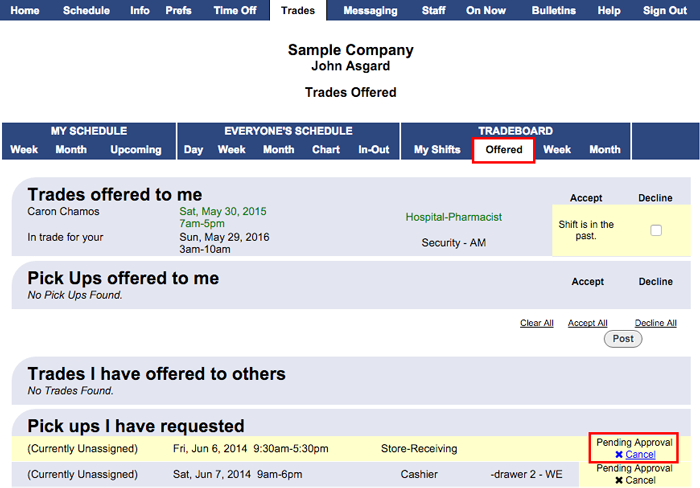 The person who first posted the shift for trade can cancel it at any time before the manager makes a decision. If you have a shift trade or pickup request you want to cancel, you may do so by signing in and going to the TRADES>Offered section. You will see a "Cancel" link next to offers that you are able to cancel. If you want to cancel an offer that is not listed, you will need to contact the other worker or your scheduling manager.